The old saying is, you learn something new every day. 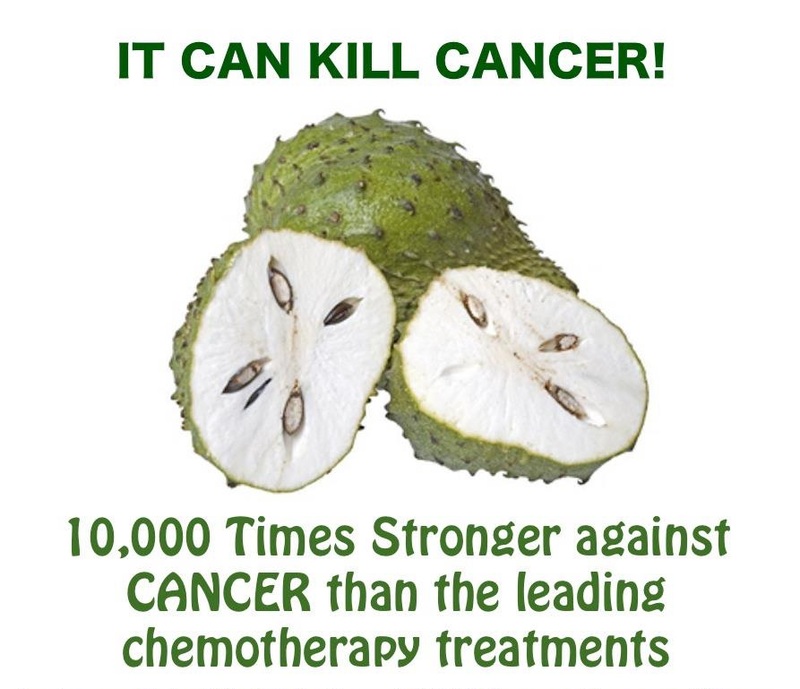 Well, thanks to one of my dedicated followers Amy, I learned about a fruit called Soursop which is suppose to kill cancer cells better than chemotherapy but without the side effects. As soon as I heard about this healing fruit I just had to research it and find out more information. So here is what I found. The flavor is described as a strawberry, pineapple mix with a little sour citrus and underlying creamy coconut or banana flavor. The fruit has high amounts of vitamin C, vitamin B1, and vitamin B2. It is also high in carbohydrates…particularly fructose (natural sugar). Now for the amazing news! According to cancer research done in the UK, the fruit has shown to be a cancer remedy, killing cancer cells up to 10,000 times more effectively than strong chemotherapy drugs, without the side effects or harming healthy cells. It also has proven to be an antimicrobial agent for both bacterial and fungal infections, lowers high blood pressure, works against internal parasites and worms, and is used for stress, depression and nervous disorders. So, you may ask, if this fruit works better than chemotherapy without harming healthy cells and without subjecting people to horrible side effects, than why haven’t I heard of it? Well, I asked myself the same thing and sure enough, like most natural remedies and why they are not used over conventional medicine it all comes down to the almighty dollar! A large drug company actually spent unspeakable amounts of money and nearly seven years doing research on the Graviola tree and it’s powerful anti-cancer ingredients however, in the end they were unable to isolate and produce man-made clones of the product and so they let the research die and they shelved the whole project and did not publish any of the findings or research. So, bottom line, if they can’t make billions off it, why should they let anyone know about it. They can instead produce chemo drugs and other pills to treat you and make their profit, while you suffer. Soursop fruit can be used in many ways. It can be eaten, just like most other fruits, or it can be juiced, or made into a tea. The only negative effects that have been reported include fatigue and an increase in the possibility of developing Parkinson’s disease. Wait a minute, did I say Parkinson’s? That’s right, however the studies that found an increased risk in Parkinson’s were done with extremely high amounts of the fruit ingested and if eaten in moderation this was not seen as a side effect. Also, with the regard to the fatigue, this is associated with consumption of the leaves and tree bark, which may be included in the tea but you will not ingest with the fruit or juice. I called my local produce place that is only about 1 mile from my driveway and asked if they had any soursop fruit. I was disappointed to hear that they did not have any, but was happy to hear that they do carry it at different times in the year (more in the summer). So, I will get one and see what it tastes like. I love exotic fruits and I love mixing different flavors in my green smoothies. Meanwhile I may also search at the local health food store, 2 miles down the road and see if they carry any of the fruit, juice, or tea. Thanks again Amy for the tip. They often have this at the Latin supermarket, COMPARE in Palm Bay. You are most welcome! I always say God knows best. He makes things in their purest form and gives us medicine of the earth. 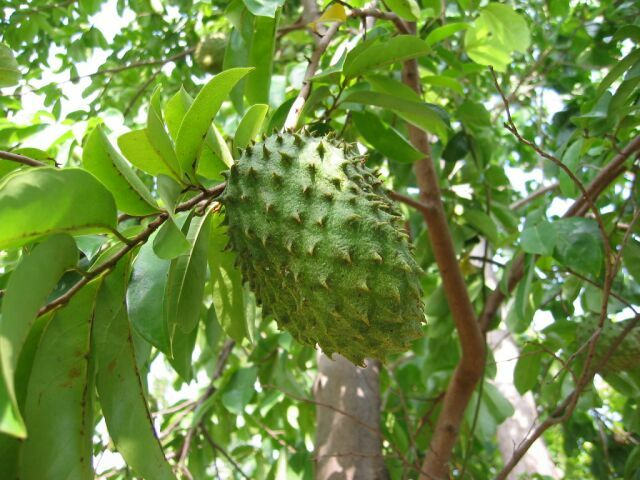 It is also produced in supplement form, called graviola or guanabana. The hardest part is getting people who think only conventional medicine works to have an open mind to try it. It’s frustrating and heartbreaking. 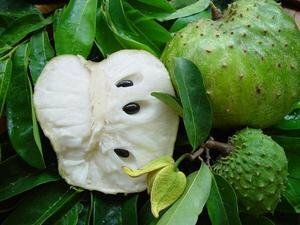 Thank you so very much, Kristen, for highlighting soursop in your blog! You made my day! this is interesting. i recommend markizza soursop juice that i bought from amazon. it tastes just perfect. I was born in Trinidad W.I. we have the soursop tree in our back yard, we use the fruit to make a delicious drink, in ice cream, never heard anyone coming down with Parkinson disease from using the fruit, but then again no big time research was done in my country to extract the whole tree for it’s medicinal purpose, what I am saying is that we complicate things so much, God gave us this wonderful fruit why not use it in it’s purest form, when I got a severe cold when I was a child, my mom took to uur garden for a cure, and it helped.